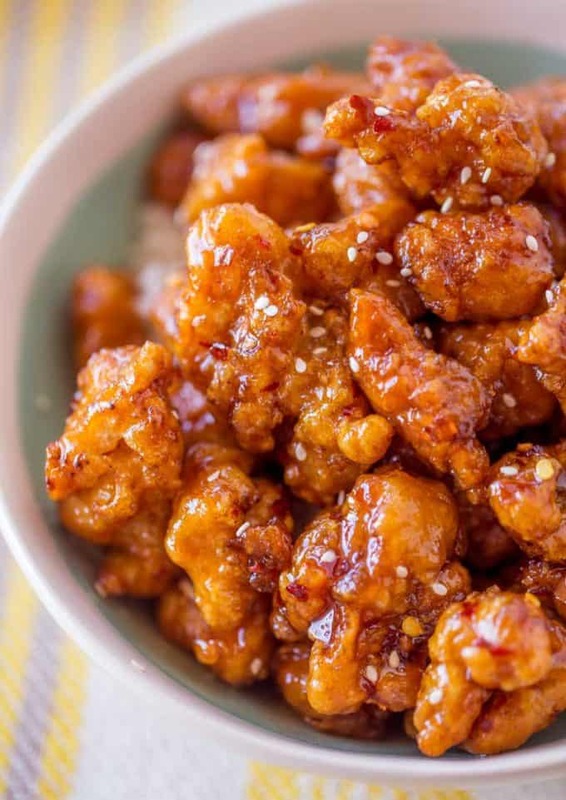 Crispy Korean Fried Chicken in a spicy, sweet glaze that is so crispy and sticky you’ll coat everything in this sauce from wings to baked chicken breasts and more! 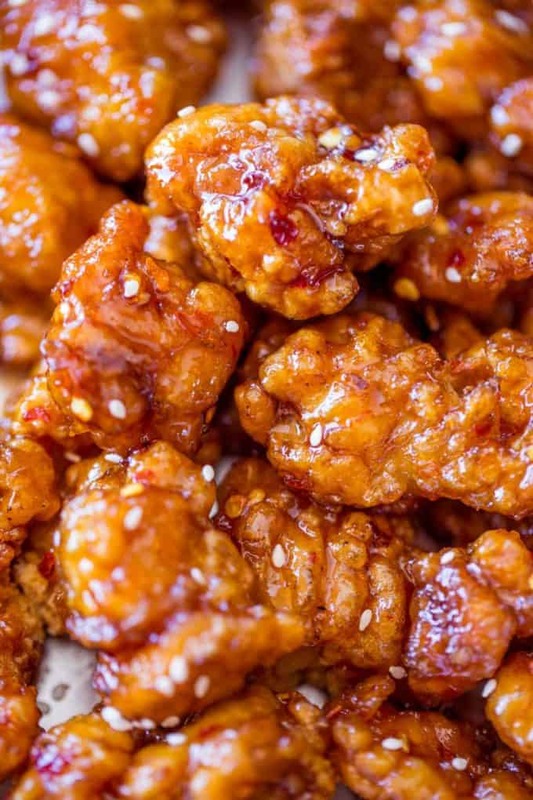 Korean Fried Chicken is a deliciously crispy chicken with a super sticky and savory bite you’ll love. Plus it takes just 20 minutes to make it! 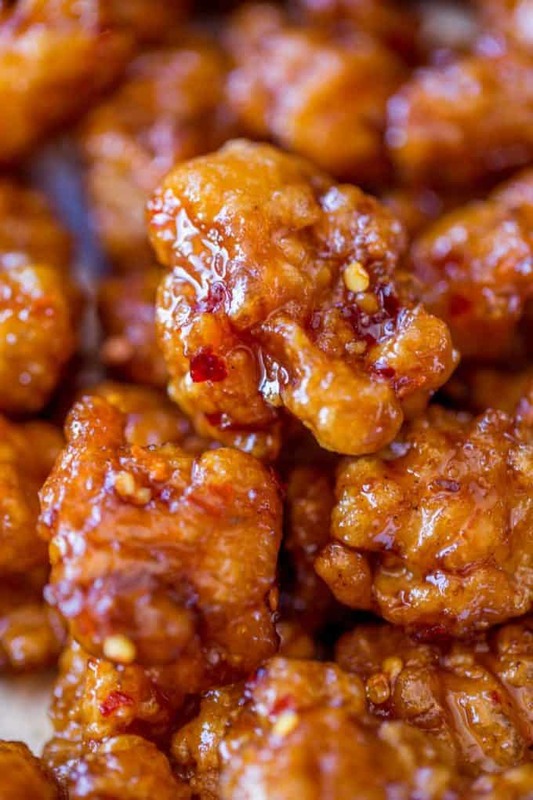 Korean Fried Chicken is a dish I first tried in New York about ten years ago. The spicy gojuchang red pepper paste immediately adds a ton of flavor that is balanced by the sweet and acidic notes of the brown sugar and rice wine vinegar. It may sound like a lot of flavors going on, but honestly it is just a few ingredients and once you try this blend of flavors I guarantee you’ll be topping it on all the different cuts of chicken you can find! 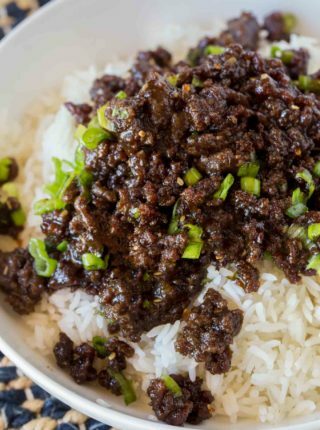 The version I tried in New York was at Momofuku and it was based on a bibim sauce which is much more heavy on the soy garlic sauce than this recipe which is based on gojuchang. You can also try a few different breading options. 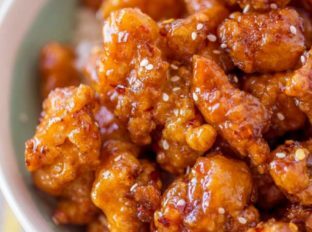 Serious eats uses baking powder to create a super crispy exterior (but requires a bit of drying time), I have a tempura batter I love (look to my Crispy Sesame Chicken for that breading) and there is of course the rice batter used in the Spicy Cashew Chicken. Korean Gochujang: This is the primary flavor in Korean Fried Chicken, I wouldn’t swap it for any other ingredient. You can also find it in your local Asian grocery stores. There is a more Americanized brand as well from Annie Chun’s too if you can’t find the more authentic version. 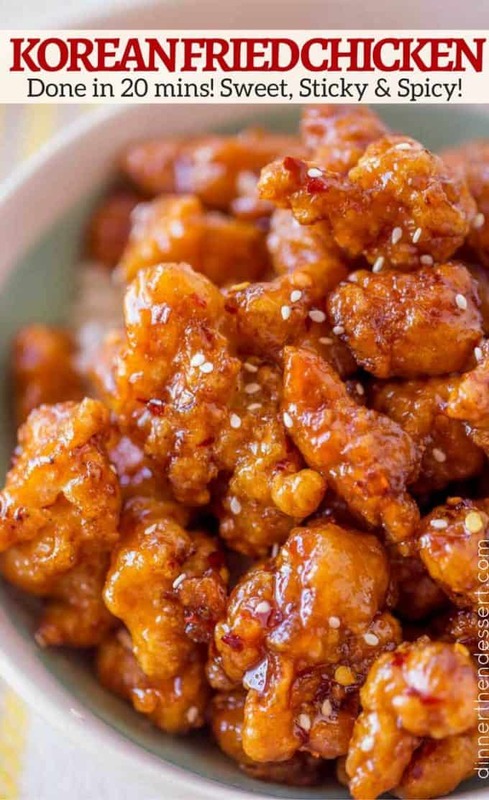 Crispy Korean Fried Chicken in a spicy, sweet glaze that is so crispy and sticky you'll coat everything in this sauce from wings to baked chicken breasts and more! Tweaked this a little due to what was available . I used Sriracha , red wine vinegar, grated ginger, grated garlic , brown sugar , soy sauce, and a splash of lemon juice and cooked the sauce a little but it tastes amazing thanks for the inspiration!! You’re welcome, Bradley. So glad you were able to adapt to what you had on hand. I made it once exactly as you say, and today I tried again changing all the coat for just cornstarch and double frying the chicken. The result was extra-crispy and delicious! Oooh that sounds so delicious! I want to try that too! Thank you for the review and now I just want to eat Spanish food! I made this last night. It was so delicious – I made tons and it was all eaten. I used potato starch instead of cornstarch because I prefer the taste, otherwise I did exactly what you said. We had it with rice and green salad. Thanks Sabrina! From Pil in Tasmania. Thank you so much for taking the time to come back and letting me know how much you enjoyed it, Pil! I appreciate the 5 star rating. Hi. Instead of the paste, can I use McCormack Korean red pepper? It something I bought in the spice aisle. I think they have a different consistency. The paste is thicker than the spice blend. I’m not sure it would work. If you decided to try, I’d love to know how it turns out. Thanks! It’s really hard to duplicate the complex flavor of the paste. It’s availabe on Amazon if you are still needing to find it. Hi, regarding the sauce portion of the recipe, I added 1/3 cup of the pepper paste, and it’s really spicy and opaque, doesn’t look like your recipe one at all, am I doing it wrong? I’m not sure what it could be. Did you change any ingredients or amounts? If you’d like, you can email me at contact @ dinnerthendessert .com and we can try and troubleshoot to figure it out. Hi Sabrina. Curious what kind of oil you would recommend. I am so looking forward to making this! 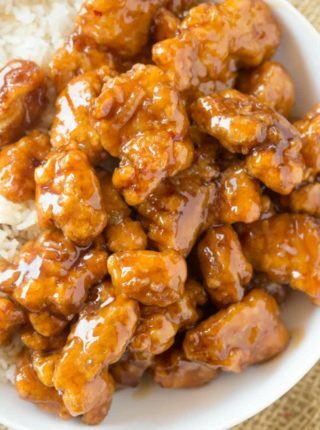 My teen loves to eat Panda’s orange chicken. Want him to take a break and try the korean way! The next time I do this, I am SO tagging you on the ‘gram. Thank you so much for sharing this. I made a couple of small edits: for the bird, I skipped the egg wash and dredged in a mix of half potato starch and half rice flour (I tried it with the egg and cornstarch the first time out and the texture was a little off but I see how it works for thigh or breast pieces rather than party wings). For the sauce I added sriracha, ginger paste, and chopped garlic. my husband went wild, my coworkers went wild and I am THRILLED to have another copycat dish in the bag! Yes, tag away!! Thank you so much for all the positive feedback! Love it! I thought this recipe was baked not fried. Sorry if there was any confusion but these are fried. pretty sure i’d devour this entire recipe! It’s hard to share….the struggle is real, haha! 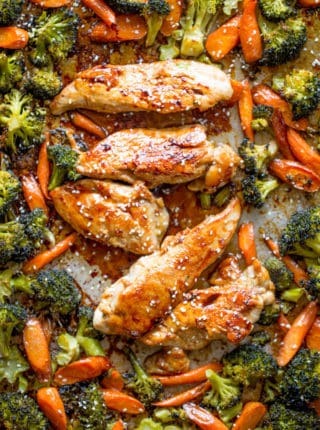 Swooning over how delicious this chicken looks! I have to make it soon! I love quick savory meals! Perfect for our busy weeknights! Definitely, we all need a break once in a while! Wow! 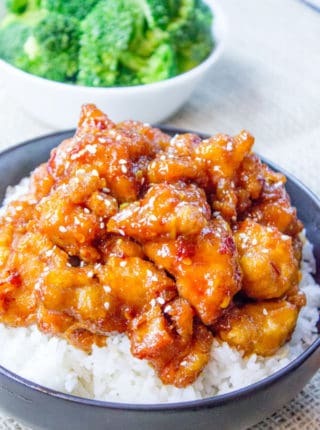 What a great chicken dish! I want to devour some right now! Oh wow! I need this and a fork, stat! This is just the kind of dish I crave – it looks amazing! I am looking at the sauce portion of your recipe. The instructions list water as one of the 5 ingredients to be combined. But, the list of ingredients does not include any water. I could improvise, but would prefer to have the proper amount. How much water should be added when making the sauce? Thank you! Skip the water, I dropped it from the recipe after additional recipe testing and forgot to remove it from my directions. Sorry about that!